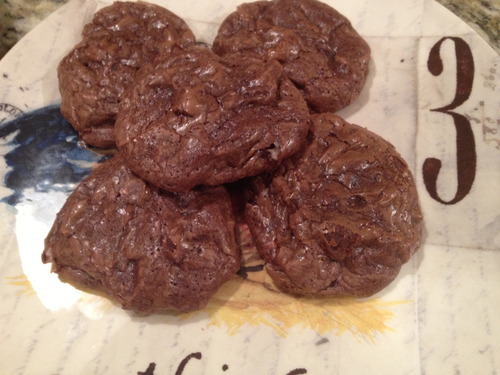 These double chocolate peppermint cookies are a bit of a legend in my house. My mom makes them every winter, and quite often, a good chunk of the dough doesn’t even ever get baked because my brother and I eat it before it ever hits a cookie sheet. In order to earn the name “double chocolate,” these cookies require a LOT of chocolate. This does make them a bit time intensive (and expensive), but this year I tried using the Cuisinart to replace some of the chopping, and I have to say, I think they’re just as delicious. Note: these can also be made gluten free with ½ cup of rice flour or gluten free flour instead of regular flour. 1. Mix the flour and baking powder together and set aside. 2. Now let’s get started with the bittersweet chocolate. I threw it all in the Cuisinart and pulsed it until it had broken into smallish pieces. Now divide this chocolate in half. 3. If you have a double broiler, you’ll want to go ahead and get that out. Or if you’re like me, and it’s on your Christmas wish list, place half of the bittersweet chocolate, the butter, and the unsweetened chocolate (which can also be cut in the Cuisinart) in a metal bowl on top of a pot of boiling water. I wait to put the bowl on top until the water is bubbling and then I turn it down to medium heat, stirring regularly. 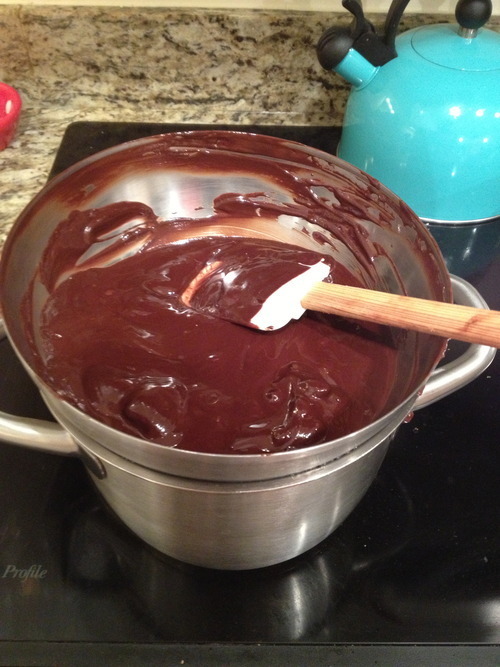 Keep going until all of the chocolate is melted. Once done, set aside. 4. Next up are the wet ingredients. In your electric mixer, with the whisk attachment, mix the eggs, sugar, and vanilla for ten minutes on high. By the end, it should be thick and should slowly fall off the whisk attachment when lifted up. 5. 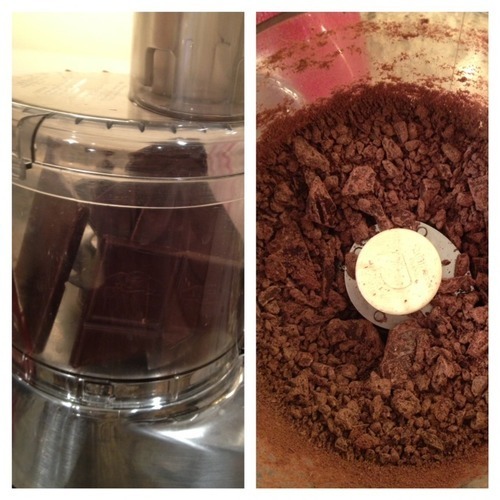 Add the chocolate butter mixture slowly to the electric mixer. Make sure to use your spatula to scrape down the bottom of the bowl so that it is all mixed. Now add the dry ingredients. 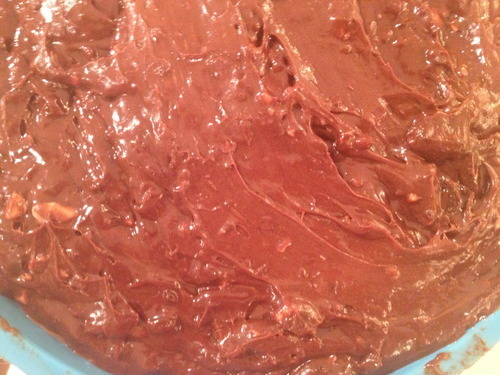 Once incorporated, add the remaining chocolate chunks and the peppermint pieces. 6. Unfortunately, the next step is chilling the dough. I only say unfortunately because at this point you can taste the dough and so you know it’s amazing, and therefore, probably don’t want to wait to bake them. At a minimum, you should chill them for a couple of hours. But you can also do it for up to four or five days (I baked half after four hours, and saved the rest to bake this weekend). 7. Whenever you are ready to bake the dough, preheat the oven to 350 degrees. Put parchment paper or silicone baking sheets on two baking pans. Now place the dough on the sheets in about tablespoon size balls. Make sure to leave some space, about two inches, in between each cookie. Bake the cookies for 9-12 minutes. You don’t want to overcook these guys, they’re the best when they’re soft. If you’re not going to be able to eat all these cookies right away, they freeze really well. But let’s be honest, these guys are going to be gone really fast. They’re delicious.